EASTON, Mass. (CNS) — Presentation of the “positio,” or official position paper, on the life and holiness of Father Patrick Peyton to a Vatican congregation is the latest step in the sainthood cause of the Holy Cross priest. A May 18 statement issued by Holy Cross Family Ministries in Easton said the document was four years in the making and is the synthesis of a 6,000-page report completed by tribunals in the Archdiocese of Baltimore and 34 other dioceses around the world. Father Peyton came to the United States from Ireland in 1928 when he was 19. 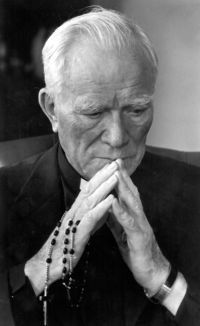 Ordained in 1941, he was the founder of Holy Cross Family Ministries, which includes Family Rosary, Family Theater Productions, Father Peyton Family Institute and Family Rosary International. His ministry produced more than 600 radio and television programs and 10,000 broadcasts. The priest also conducted rosary crusades for millions of people in dozens of countries. Father Raymond, president of Holy Cross Family Ministries, delivered the “positio” to the Vatican Congregation for Saints’ Causes April 21. Joining him were Andrea Ambrosi of Rome and Holy Cross Father David S. Marcham of North Easton, who are, respectively, postulator and vice postulator of Father Peyton’s cause. Cardinal Luis Antonio Tagle of Manila, Philippines, was there as well. Father Peyton died in 1992 and is buried in Easton. His sainthood cause was opened in June 2001 in the Diocese of Fall River. It was moved from that diocese to the Baltimore Archdiocese by the Vatican, citing the archdiocese’s experience with other sainthood causes.